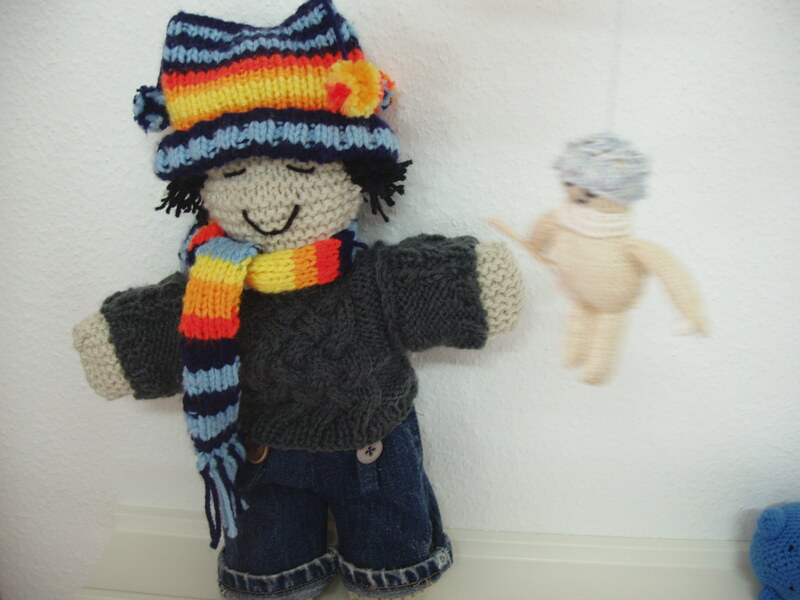 Yes, the spirit came to me 2 days ago and I have been busy designing and knitting him. lol! A friend emailed me and asked if I would like to join a knitting contest. It has to be 4inches high and an ornament. I supposed it is for a christmas issue of a needlework magazine. Anyway, I made initial drafts and develop the design. 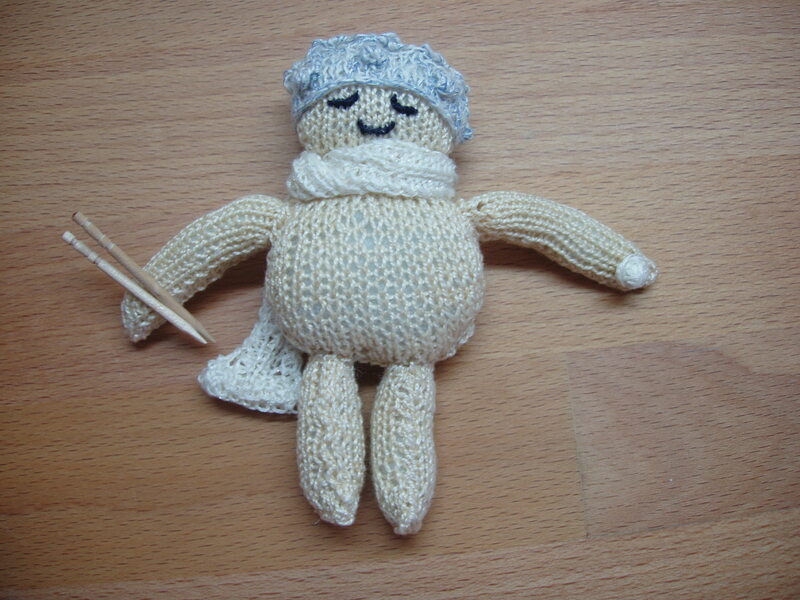 The patterns: I found this basic doll of Carol Meldrum of the Knitted Icons book. I modified it so it would be 4 inches high. I designed the hat, scarf and would-be gown. 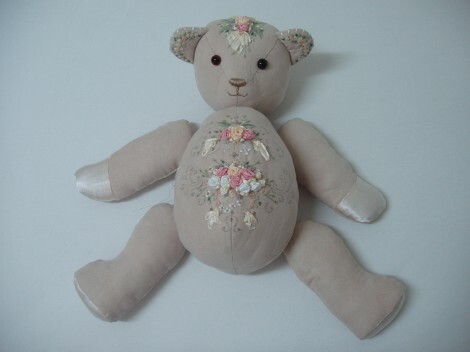 I used the stitches in Reader´s Digest Complete Guide to Needlework. 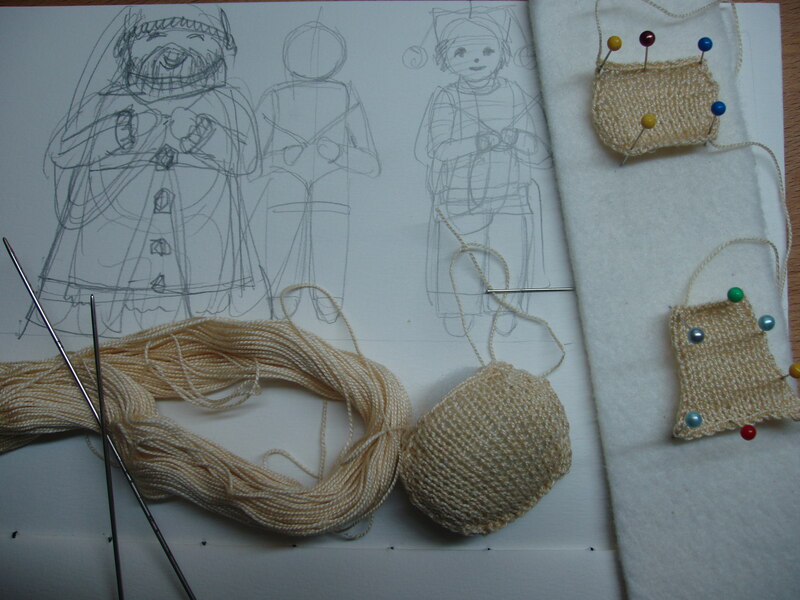 The materials: I used a perle coton for the basic doll. A friend of a friend gave up crocheting a long time ago and I received his stash of perle coton. Fiberfill for stuffing. I mixed 2 strands DMC linen(ecru) with 1 strand Madeira Opal metallic thread (blue). The face details are made with 2 strands DMC navy blue. I used the finest double end knitting needles, those used for socks. Then, I woke up today, Sept. 4, 2009, realizing my stitches are not that even after all. I am just not satisfied with my uneven tension. I still have to learn a lot. And so I gave up halfway and decided to keep the Spirit of Knitting to myself. I do not want to finish his blue lace jacket anymore. To make the enchanted needles, I took 2 toothpicks (with decorative ends) and cut it shorter, shaped the tips, and glued it to his hands. I made an enchanted ball of yarn with DMC linen thread and glued it on his other hand. "You wished to be a real human? Sorry, wrong number." "Of course, you can´t see my clothes. It is enchanted too. You have to use your imagination. heehee!" 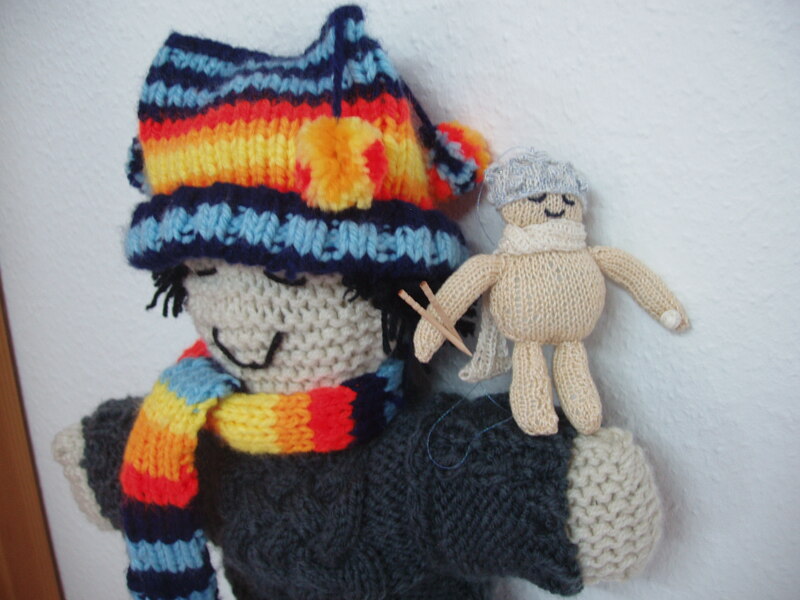 Sam is a knitted doll, wearing a knitted pullover of various cable knits and a 3-cornered hat with pompoms and a scarf of matching colors. I took a photo of my knitted and crocheted toys. Totoro and Amineko are free amigurumi (crochet) designs from the internet. Click on the links to make your own! 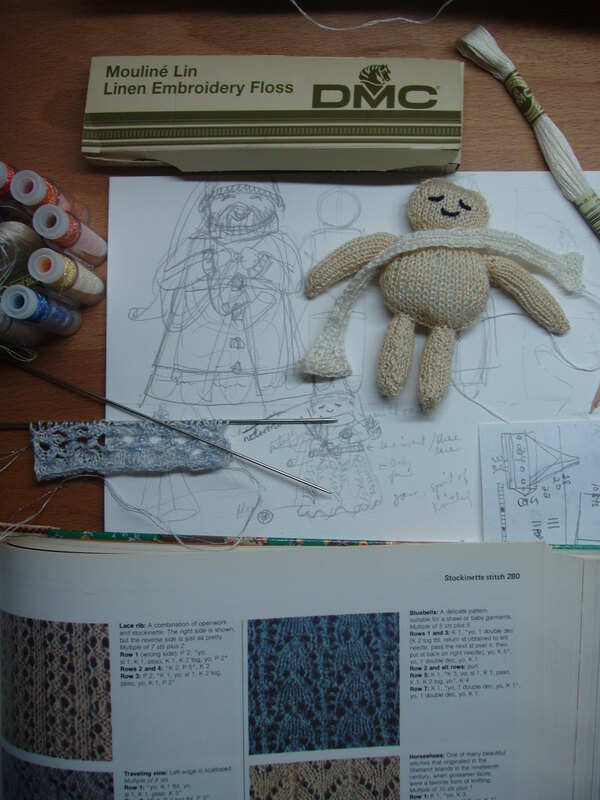 My Sam is a simple knitted doll from a knitting book, the form looks like a gingerbread man. Then I designed his over all look, his hair, his face, his hat and pullover and jeans.